The Immaculate Conception, St. Thomas, and Blessed Pius IX. – Basil Cole, O.P. & Francis Belanger, O.P. St. Thomas, Norman Kretzmann, and Divine Freedom in Creating. – Lawrence Dewan, O.P. The Question of Evil and the Mystery of God in Charles Journet. – Gilles Emery, O.P. 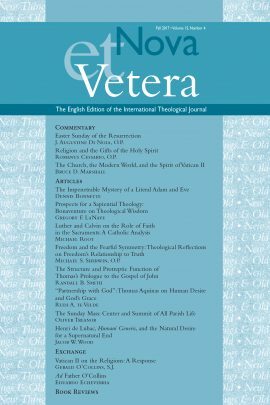 Thomist Premotion and Contemporary Philosophy of Religion. – Thomas M. Osborne, Jr. The Paradox of Nature and Grace: On John Milbank’s The Suspended Middle: Henri de Lubac and the Debate Concerning the Supernatural. – Edward T. Oakes, S.J. Aristotle East and West: Metaphysics and the Division of Christendom by David Bradshaw – David B. Burrell, C.S.C. A Short History of Thomism by Romanus Cessario, OP – Thomas G. Weinandy, O.F.M. Cap. Be the first to review “Nova et Vetera, Summer 2006 (Vol. 4, No. 3)” Click here to cancel reply.